There are 194 nations in the world. Out of those, precisely 193 acquired their territory through the use of military force. That is how borders have traditionally been drawn. Most of these campaigns were offensive. I have asked many military experts, historians and scholars about this, and they have, to a person, told me that there is only one nation in the world who gained territory through the use of force that has been sued, time and time again to relinquish that territory. You guessed it: the state of Israel. What is so profoundly outrageous about this is that Israel acquired lands in defensive wars. It is not as though Israel is a colonial state that set out to acquire land to enrich itself. Israel acquired the Golan Heights in an act of self-defense when they had been attacked on all sides in the 1967 war, and managed to successfully retain this land in the 1973 war. Syria is a failed state. We have seen how the eight-year-old brutal Syrian civil war at the hands of Bashar Assad has left at least a half a million of his own people dead, and 5.6 million refugees along with 6.8 million internally displaced persons. According to a recent article in Commentary by the legal scholar Vivian Bercovici, "Since World War II, the accepted understanding of international law that involves territorial loss during conflict is quite straightforward: The attacking nation may not retain permanently land acquired as a result of armed conflict." For those who are objecting to this move: Kindly inform us of with whom, precisely, Israel is supposed to negotiate with? Let's take a look at the players inside Syria. Bashir Assad of the rump state of Syria? Abu Bakr Al Baghdadi, the head of ISIS in the Levant? Qassam Solomeini of the Islamic Revolutionary Guards Corps that works hand in glove with Bashir Assad? Hassan Nasrallah of Hezbollah, who now has approximately several thousand troops in Syria? The reality on the ground is that the 400 square miles of the Golan Heights is the demarcation line of a Hobbesian state of war of "man against man" and a relatively tranquil, democratic area. The political reality within Israel is that every Israeli, right, left and center agrees that the Golan Heights is critical for the survival of Israel. General Giora Eiland stated that "There is no solution to Israel's survival without the retention of the Golan Heights." Every Israeli knows that whoever controls the high ground of the Golan Heights controls the security of the area. Most of us have stood on the Heights, and have peered down into Damascus and Beirut. We know it affords a protective shield extending all the way down to Lake Tiberias. And the Israeli intelligence and military officials up there are the "eyes and ears" for vital intelligence and military information that they willingly share with the United States. Words matter. By framing the language of the Golan Heights as "Occupied Territory", it whets the appetite of Israel's enemies, and indicates to them that this region is still in play. 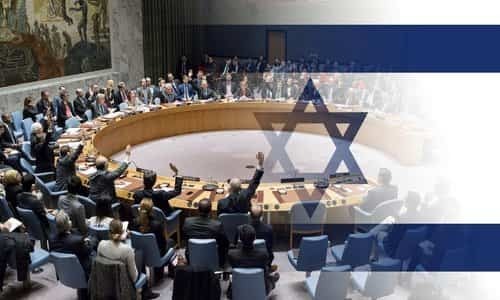 That is why it is no less than infuriating when 14 nations of the UN Security Council met on Wednesday, at the request of Syria, to condemn America's recognition of Israeli sovereignty over the Golan Heights. Would any of these distinguished representatives ever subject their own citizens of their nations to the uncertainty of "trading land for peace" if they had such wolves banging at their gates? As I have written many times in the past, the birth of Israel was supposed to have been the denouement of the age-old problem of anti-Semitism. Instead, it is the focal point for all of the anti-Semites. And many of them are distinguished representatives wearing suits and ties, casting votes in the United Nations.